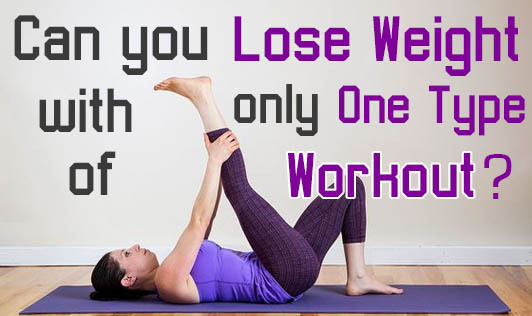 Can You Lose Weight With Only One Type Of Workout? Are you fixated on your current indoor cycling or treadmill session? Or are you doing practice workouts using the same training DVD video again? Working out consistently is good. However, if you're rehashing the same workout over and over, you may not be getting the greater part of the profits - or results - you could be! The Truth: To keep on challenging your body and enhance your strength and conditioning, you have to buck up your normal day to day workouts — and attempt to do something new every month or better still every day. Once you develop your routine, it is very natural to fall into a schedule. You may get wrapped up in your walking or gym routine and simply be doing those sort of workouts regularly. Trust me, that this is a formula for failure. If you need to get stronger and keep on challenging your muscles, you'll have to mix up your workouts! Your body adjusts to any kind of activity. The first time when you go on a run, it is presumably going to be harsh. But if it is the 40th time you’re running, it’s a lot simpler, right? As you get used to a type of activity, it seems less difficult and, accordingly, less effective. That is the reason it’s so critical to do a variety of exercises. Alternate the amount of weights you lift. Go heavy one week with less reps and lighter after that with more reps. Change the type of exercise you do for each muscle. One week, do push-ups, then chest flies, then chest presses. They all work the same part of your body, yet in totally different ways. Cardio days need variety as well! Mostly people like to adhere to one machine for cardio. But in the long run, the body will get adapted to that particular routine leading to a weight loss plateau. Be flexible. If you only have a treadmill to work with, you can still switch up your workout by performing run-jog intervals in quarter-mile bursts, or walking on an incline. There are endless approaches to consider when it comes to changing your cardio workout from week to week. You simply need to focus on getting it going. The Bottom Line: To challenge and strengthen your body, you’ll need to switch up your workouts! Attempt different forms of cardio, follow split routines, or simply switch up the weight you’re lifting and the number of repetitions.